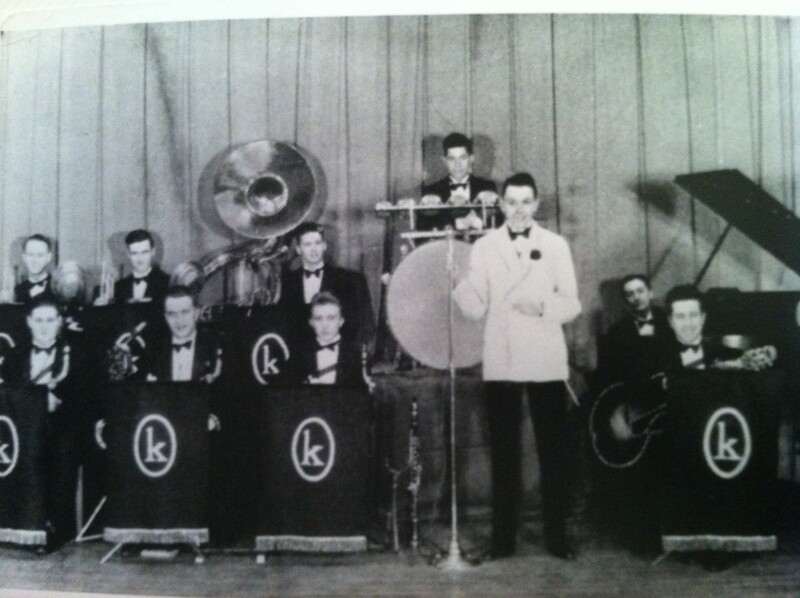 My Dad, Bill Magee, with his dance band. He is sitting in the back row just to the right of his Sousaphone. This year for our music history element, we are studying Big Band Music. We started by talking about the instruments that make up a Big Band. We have listened to some of the music and last week I pulled a couple of highlights from YouTube and let the kids watch while they did some theory. You can check out more at home. Search for Benny Goodman or Tommy Dorsey. We watched the Andrews Sisters sing “Boogie Woogie Bugle Boy” and then the Glenn Miller Orchestra perform “Chattanooga Choo Choo”. I explained that if you were young in the 1930’s and 1940’s you could go out to a dance club and dance to the music of a dance band. I told them that my dad played in one of these – Bernie Kress and his Band. He put himself thru college and medical school playing the Sousaphone in a dance band. If you have time, give Big Band Music a search at home. The harmonies are rich and the lyrics rated G … for Great. Blog looks great! Em won’t be there today – we’re on vacation this week. Thanks and thanks for letting me know – have fun and see her next week.